The main thing will span the entire flat part of the world, and be about 4 layers high. Funny enough, no i havent seen that movie before... it looks pretty cool.. Grab a mug of bacon and sit down. Noun: A network of paths and hedges designed as a puzzle through which one has to find a way. Verb: Be dazed and confused. Each Cube is Identical Just rotated. 4 Ways in, 2 Ways out. You start at the top of the highest layer, entering the maze, you drop down into a cube. You cannot get back up, so you must venture into the maze, trying to figure out a way throught this maze without becoming confused or lost. Which will always happen. When you (If you) find the entrance to the next laywe, you basically drop down into it, and continue on. You must find our way through all the layers and exit the maze at the bottom. 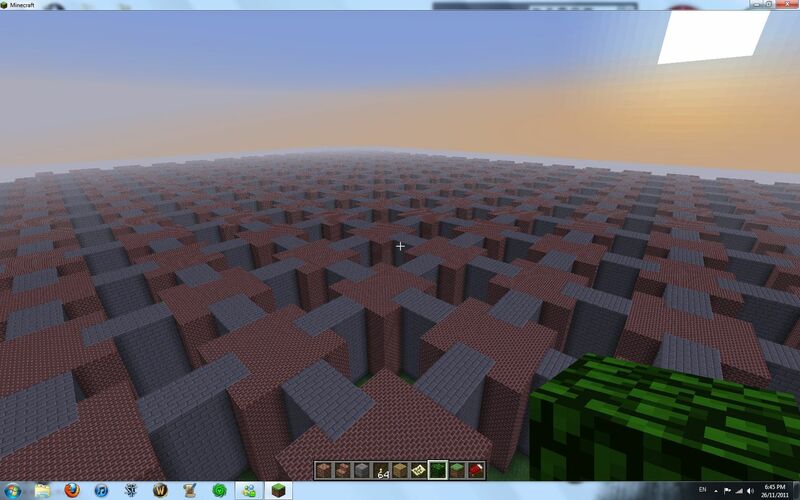 I will probably need to use MCEdit Due to the size of this maze, but i will not dissapoint! at the movie, the cube rooms move around at a controled pattern. I dont see much of a way to do such kind of a think at minecraft, to move every room on the maze at a certain pattern every hour. "the cube 3 - cube zero" is like a "pre-cube 1", where the first cube wasnt ready yet but was under test. WOW this is amazing I will definitely download! Keep up the hard work! Okay Guys, the First Layer is around 80% complete (I just need to close off the edges around the entire layer) Heres a Pic! Advil now or later? Haha. I made a 10000x10000 cubic maze at DOOM 3 but couldnt move rooms and I dont know how to worth with teleportation at DOOM 3.
sad. 100.000.000 rooms full of monsters and some traps and void around. exit at the center of the maze. anyway, are u using mcedit to do that?? I had to use MCEdit only to copy the already made rooms. The Map is 95% Done, I need someone to be able to host this map on a server..